UP State Education Board of Department invited online applications for the UP Teacher Eligibility Test 2018 (UPTET) for all eligible candidates on its official website. It is a state level examination conducted to provide government certification to candidates who wishes to become teacher in government sector. So the applicants who want to make their career in teaching field can apply for the exam on or before the last date of application. 6.1 How to Apply Online for UPTET 2018? The applicants must visit the official website of the board that is, upbasiceduboard.gov.in to send their applications on time via online mode. 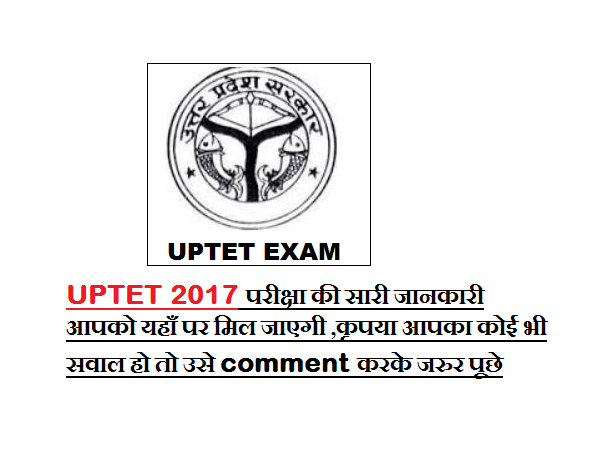 Candidates must read the information about the UPTET exam including Eligibility criteria, Age, Exam Pattern, and Important Dates etc. before applying for the exam. If eligibility or age didn’t match with the requirements then candidate’s eligibility will get cancelled. Candidates must complete their graduation with minimum 50% marks from any recognized university. For primary teacher: Applicants must have completed 2 years Diploma in (D.Ed.) or BTC or 4 years diploma in elementary education. Selection Process: The selection of candidates will be based on the score achieved by candidate in written examination. The entrance exam comprises of two papers i.e. Paper-1 and Paper-2. The following pattern of exam is given below in the form of table showing name of subjects, number of questions and number of marks. Adjustment: Concept and ways of adjustment. Role of teacher in the adjustment. Meaning and purposes of Assessment, Measurement and Evaluation.Comprehensive and Continuous Evaluation. Constriction of Achievement Test. Framing Question including Wh-questions, Active and Passive Voice, Knowledge of English sounds and Phonetic Symbols. How to Apply Online for UPTET 2018? Then click on the link ‘UPTET Online Application 2018’. On fresh page then begin with filling of Application Form. Complete the form by filling the details asked for in provided spaces. Also attach the photograph and signature of required dimensions. Then finally click on submit Button. You can download or Save the Application form for Future Reference.